A Mandoline Player was the first work of Mary Cassatt (1844-1926) to be accepted for inclusion in the Paris Salon. It was 1868. Mary had left her native Pennsylvania to learn the art of painting in Europe only two years earlier. She had become frustrated with the narrow mindedness and nastiness of the male students and faculty at the Pennsylvania Academy of Fine Arts and left to follow a self-directed course of study. This work pre-dates Cassatt’s exposure to Impressionism and is in more of the Romanticism style. Were it not for the signature, it could have easily been painted 100 years earlier. If you look Cassatt’s body of work, this is one of only a scant few pieces that has the dark brown background and overall heavy feel of the more traditional style of painting that she would later denounce. 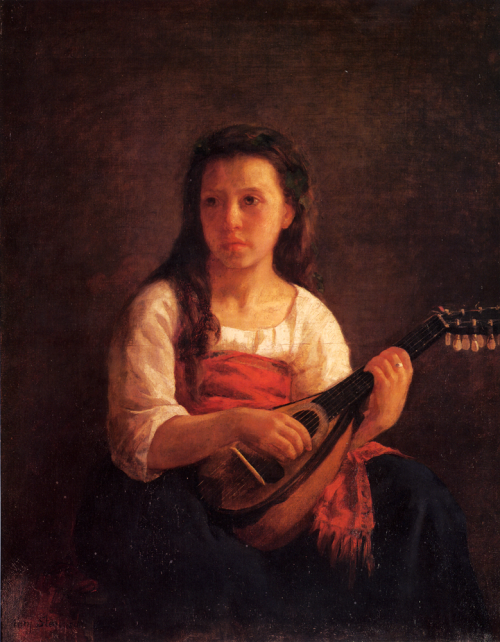 A Mandoline Player depicts a young girl playing the mandolin (mandoline is apparently the French spelling for this instrument). She’s wearing white, red and blue – interestingly enough the national colors of Cassatt’s native United States and her adopted country of France. Mary Cassatt is considered one of the most important Impressionist painters. She holds a unique place among the group as both a female painter and an American. You can learn more about this American artist and see more examples of her work by visiting our Mary Cassatt Biography.